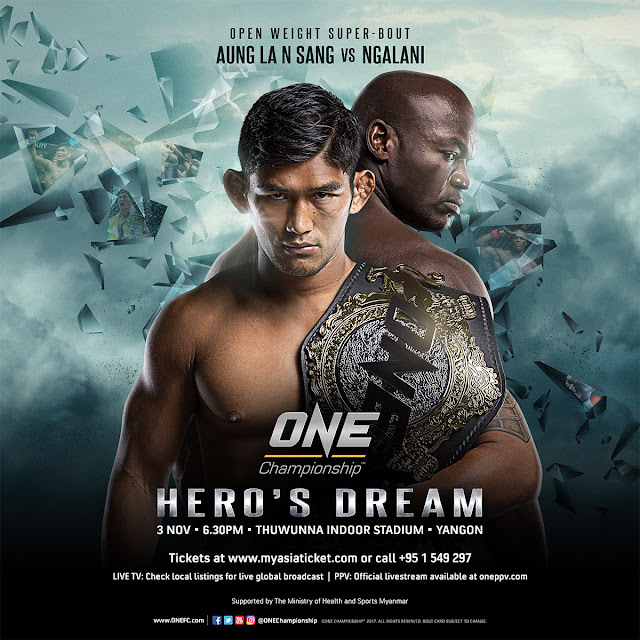 09 October 2017 – Yangon, Myanmar: The largest sports media property in Asian history, ONE Championship™ (ONE), has just announced the complete bout card for ONE: HERO’S DREAM, set for the Thuwunna Indoor Stadium on 3 November. In the main event, ONE Middleweight World Champion “The Burmese Python” Aung La N Sang of Myanmar will take on Muay Thai heavyweight world champion Alain “The Panther” Ngalani of Hong Kong in an Open Weight Super-Bout. The ONE Middleweight World Championship will not be on the line. Ticket information for ONE: HERO’S DREAM is available at www.onefc.com. 32-year-old Aung La N Sang is Myanmar’s most successful athlete in history, whose constricting style has earned him the moniker of ”The Burmese Python”. Born in Myitkyina in the mountainous Kachin State, he belongs to an ethnic minority known as the Kachin. In his most recent outing, Aung La N Sang stunned former champion Vitaly Bigdash of Russia in a highly-anticipated rematch to be crowned the new ONE Middleweight World Champion. Aung La N Sang is set to square off in his toughest challenge yet, against heavyweight behemoth Alain Ngalani. Heavyweight knockout artist Alain “The Panther” Ngalani, who trains out of Impakt MMA in Hong Kong but is originally from Cameroon, is a terrifying combination of power and speed, and is always looking to end matches early. Owning a 25-7-1, 2 NC kickboxing record which includes 23 knockouts, Ngalani is a heavyweight world champion in Muay Thai and kickboxing. Fresh off his record-setting 11-second KO of former ONE Heavyweight World Title Challenger Hideki Sekine, “The Panther” is set to figure in ONE Championship’s first-ever ‘David vs Goliath’ super bout, as he takes on ONE Middleweight World Champion Aung La N Sang in an open weight contest. An unbeaten 32-year-old martial artist from Yangon, Phoe Thaw (4-0) is set to return to action following a tremendous accomplishment at ONE: STATE OF WARRIORS where he won the ONE Myanmar Featherweight Tournament Championship. Prior to transitioning to the cage, Thaw was a successful Lethwei practitioner with a record of 3-0-2. So far in his career, Thaw has showcased a penchant for scoring highlight-reel stoppages, winning all four of his bouts by knockout. One of the fastest rising stars in Myanmar, Thaw is now set to face countryman Saw Ba Oo. Saw Ba Oo is a martial artist hailing from Yangon, Myanmar, and is a promising young talent in ONE Championship’s featherweight division. He made a successful ONE debut in 2015, and has since gone 2-1 in his career. Prior to transitioning to the cage, Saw was a Lethwei star with a 16-4-18 record. In his most recent bout, Saw scored a second-round technical knockout victory over Kyal Sin Phyo. Next up, Saw will take on rising star Phoe Thaw. 23-year-old Chinese national freestyle wrestling champion “The Southern Eagle” Ma Hao Bin is unbeaten inside the ONE Championship cage. Making his professional debut in 2016, Ma took home the ONE: DYNASTY OF CHAMPIONS (CHANGSHA) Flyweight Tournament Championship, defeating Wu Ting Shen and Bu Huo You Ga in a single evening of action. Since then, Ma has strung together an impressive 7-1 professional record which includes three wins by submission and one by knockout. He will now take on Eugene Toquero. Top flyweight contender Eugene Toquero is a former celebrity martial arts and fitness coach from Manila, Philippines. The 5’5” Filipino stalwart has a knack for executing highlight-reel striking techniques and is highly unpredictable, operating at a pace opponents find difficult to keep up with. In his most recent bout, Toquero fell to rising star Stefer Rahardian of Indonesia, losing by unanimous decision in a tough contest. Now Toquero seeks to get back in contention when he takes on Ma Hao Bin. Unbeaten Tha Pyay Nyo of Myanmar owns an unblemished professional martial arts record of 4-0 and is the 2015 ONE Myanmar Featherweight Tournament Champion. A devastating Lethwei striker, Tha Pyay Nyo transitioned to martial arts in 2015 and has since impressed inside the cage. A proven finisher, all four of Tha Pyay Nyo’s victories have come by knockout. He will return to the ONE Championship cage to face Asraful Islam, who makes his promotional debut. 21-year-old bantamweight Asraful “Warrior” Islam of Dhaka, Bangladesh, is a martial artist making his professional debut. With a an amateur career that saw him go a perfect 2-0, Islam is the former UFI Bantamweight Champion. Specializing in wushu, boxing, Muay Thai, and Brazilian jiu-jitsu, Islam is incredibly well-rounded and is ready to put his skills on full display. He makes his ONE Championship debut against Tha Pyay Nyo. 21-year-old Pongsiri “The Smiling Assassin” Mitsatit is an undefeated martial artist from Chiang Mai, Thailand, and was previously a North Thailand Muay Thai champion with a 72-17 record, which included 49 KOs. Since making his professional debut in the cage, the strawweight has amassed a stellar record of 8-0 with six knockout triumphs and one submission victory, and made an immediate impact in ONE Championship with first-round finishes over Ye Thway Ne and Rabin Catalan. In his next outing, Mitsatit will share the ONE Championship cage with Jeremy Miado of the Philippines in a three-round strawweight contest. Filipino strawweight champion Jeremy “The Jaguar” Miado of Manila is a martial artist with a 6-1 professional record. After six straight victories, including two highlight-reel finishes, Miado took on countryman Robin Catalan in his most recent bout, but fell just short of victory, losing by split decision. Miado is now ready to get back in the win column, and will face a rising star from Thailand in Pongsiri Mitsatit. Winner of the 2017 ONE: LIGHT OF A NATION Flyweight Tournament, Saw Min Min is a Lethwei practitioner with a 10-0-5 record and is unbeaten at 2-0 in the ONE Championship cage. Both of his victories in ONE have come by way of stoppage, including one submission and one knockout that prove his well-roundedness. Saw now looks to record his third straight win, this time over Ye Thway Ne. Veteran Lethwei star and professional martial artist Ye Thway Ne of Myanmar made his ONE Championship debut in 2016, and has since gone 1-1 in his professional cage career. He owns a stellar professional Lethwei record of 41-1-29. In his most recent contest, Ye battled Pat Kyaw Lin Naing to a unanimous decision victory after two rounds. Ye is set to return to action this November opposite countryman Saw Min Min. Unbeaten Chinese martial artist “Rock Man” Chen Lei of Changsha is a Brazilian jiu-jitsu practitioner and the Shanghai Open BJJ Champion. His submission prowess has led Chen to six straight victories as a professional. In his last bout, Chen continued his spectacular win streak with an armbar finish of Malaysia’s Saiful Merican. Chen now moves on to his next contest, a tough assignment against the Philippines’ Burn Soriano. Burn “The Hitman” Soriano of Ilocos Sur, Philippines, is coming off a tough contest against Malaysian Saiful Merican last February. The Filipino featherweight features an aggressive style, with solid power and seasoned grappling technique leading to all of his wins to date coming by way of stoppage. His 15-second spinning back fist knockout of Indonesia’s Mario Sitya Wirawan in 2016 was one of the fastest finishes in ONE history, and he will be looking to replicate that accolade against Chen Lei in his next outing. 30-year-old “Supermom” Miao Jie of Shanghai, China, is a professional martial artist with a 4-1 record. A talented grappler, Miao recently won a bronze medal at the 2017 IBJJF World Championships in Long Beach, California, USA. In her most recent bout, Miao needed less than a minute to submit Egypt’s Mona Samir via armbar at ONE CHAMPIONSHIP: SHANGHAI. Looking to make a name for herself in Asia’s premier martial arts organization, Miao seeks to showcase her complete skills as she returns to the ONE Championship cage against Amira Hafizovic. Female strawweight Amira “The Wandera” Hafizovic of Australia is a professional martial artist with a record of 1-0. Representing Australian Top Team, Hafizovic has well-rounded striking and grappling skills as she has proven capable of finishing on the feet or on the ground. After a successful amateur career, Hafizovic was victorious in her professional debut, defeating Meg Gallagher via first-round submission. She specializes in Brazilian jiu-jitsu, with a grappling record of 25-5. Hafizovic’s ground skills will be put to the test, as she makes her ONE Championship debut against China’s Miao Jie. “The Ghost” Zhang Ze Hao of Shanghai is a professional martial artist from China with a record of 3-2. He made his promotional debut at ONE CHAMPIONSHIP: SHANGHAI in early September, finishing compatriot Li Cheng Chao via technical knockout in the third round. Zhang, a proponent at the AMA Shanghai Gym, is a sanda and Brazilian jiu-jitsu practitioner. He is set to do battle against Bala Shetty in a three-round lightweight contest. An eight-time Muay Thai national champion in India, Bala Shetty is set to return to the ONE Championship cage following a brief appearance at ONE: WAR OF DRAGONS in July of 2014. In his first ever professional cage contest, Shetty succumbed to Taiwanese star Jeff “The Machine” Huang via first-round technical knockout. Shetty now looks for redemption as he steps back onto the biggest stage of competition against China’s Zhang Ze Hao. Decorated Indonesian martial artist Nita Dea first took up wrestling in high school, quickly becoming a two-time national wrestling champion. She has since added wushu, Muay Thai, and kickboxing to her arsenal, with three national wushu championships proving her aptitude and well-rounded ability. Taking a 12-4-0 professional record in kickboxing and Muay Thai into her ONE Championship debut last May, she fell to Thai star Rika Ishige, but now returns to the cage seeking victory against the Philippines’ Jomary Torres. Jomary Torres, a martial artist representing Catalan Fighting System, is an unbeaten female atomweight talent from the Philippines. Armed with a complete set of striking and grappling skills, Torres is incredibly talented and determined to make a name for herself in ONE Championship. In her last bout, Torres scored a shocking upset victory over rising star Rika Ishige, winning via second-round rear naked choke to bring her cage record to 2-0. She is now set to return to action against Indonesia’s Nita Dea.